Stainless steel is a low carbon iron based steel sheet which has other metals mixed to increase corrosion resistance and strength. It always contains 10% chromium in it. The combination of metals like nickel, aluminium, silicon, sulphur etc decides the grade of stainless steel. Stainless steel is 100% recyclable and easy to sterilize. Stainless steel sheet metal is different from common stainless steel. It is not prone to rusting, staining or corrosion in contact with water. It also considered as a low conductor of electricity. The steel used is corrosion free. Weather conditions do not affect the flowerpot. It won’t rust when comes in contact with water. It will not stain too. To keep the plants indoor, the flowerpots are coated with additional film of complete water proof. It is best to add a look to the modern exterior of the home. It is simple, elegant and cool to look at. It has got a flawless look done by welding that an human eye cant detect. It is easy to clean. With a wet cloth one can remove dust or oil on it. Steel metal pots are very appealing to the eye. They can be placed just anywhere in home or office and they add more to the beauty of the environment. Beneath the pot holes are done so that the excess water drains out automatically. Being rust free it doesn’t leave stains of the rust too. Inside of the flowerpot is coated with plastic layer; It prevents leakage of water and moisture. Planting a flowerpot made of stainless steel adds beauty to the space. They are not only dramatic but stylish in their appearance too. It is easy to take care of and clean it. 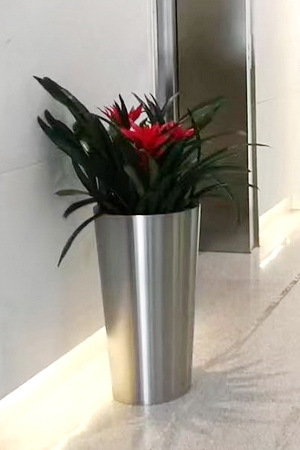 Usually stainless steel flower pots are found in big offices, entrance areas or hotels. There are many shapes and sizes to choose from to enhance a particular space. One can plant vegetables, fruits, plants or flowers. Stainless steel pots are best for all types of plants all round the year. Stainless steel flowerpots are extensively available online and at the plant shops too. One can decide upon the weight of the pot to be bought. If it is to be kept inside, opt for a light weighted flowerpot so that it can be cleaned and shifted or picked from time to time. If it is to be kept outside in the garden or at the gate entrance then one can opt for a slightly heavier metal pot. The uses and qualities of a stainless steel metal is amazing. It saves the money of the customer by its durability. Every now and then one does not have to spend money on new pots. Opt for stainless steel flower pot and make your life easier and hassle free.